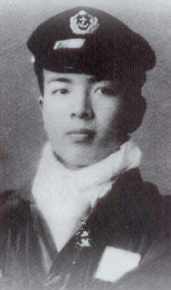 On August 11, 1945, Flight Petty Officer 1st Class Norihide Uenishi died at the age of 18 when submarine I-366, which was carrying five kaiten manned torpedoes, launched his kaiten at an enemy convoy about 500 nautical miles north of the Palau Islands. The convoy was about ten kilometers away from the submarine, and only three of the five kaiten weapons launched successfully. Submarine crewmen heard three explosions, which the captain concluded were from hits on enemy ships, but American records do not indicate any hits. On August 1, 1945, submarine I-366 had made a sortie from Hikari Kaiten Base in Yamaguchi Prefecture with five kaiten pilots who were members of the Kaiten Special Attack Corps Tamon Unit. Uenishi was from Fukuoka Prefecture and was a member of the 13th Kō Class of the Navy's Yokaren (Preparatory Flight Training Program). He previously had been at Nara Naval Air Group. He received a promotion to Ensign after his death by special (suicide) attack. Kindness does not go unrewarded. As a young Japanese man, become a shield. There is nothing else that I have to leave you. The sea is me. The blue calm sea is my normal self. On the contrary, the rolling waves are my face when I am angry. You are growing quickly. I always will be watching you. The letters do not include a date. Based on this and the letters' contents (e.g., no mention of kaiten mission), it appears that Uenishi did not consider these to be his last letters before his death. The letters come from Mediasion (2006, 99). The biographical information in the first paragraph comes from Konada and Kataoka (2006, 279-84, 373-4) and Mediasion (2006, 68, 86, 99).